A common criticism levied against religion generally and Christianity specifically is that it is simply wish fulfillment, a human invention to help us manage our anxiety in the face of a chaotic world and eventual death. Wanting something to be true doesn’t make it true. And Christianity is just whistling in the dark to keep our hopes alive. Some answer such arguments by saying that just because we desire it to be true, doesn’t mean we are inventing it. Starving people didn’t invent the idea of food. Human longing could be an indicator of truth as opposed to falsehood. Others counter that advocates of wish fulfillment desire Christianity to be untrue and therefore, using the same criteria, their position can equally be falsified as wish fulfillment. To my mind, the most satisfying answer to this objection, an answer that honestly deals with the objection rather than obfuscate or accuse, comes from C.S. 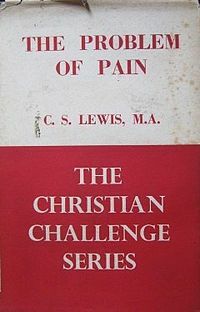 Lewis’s work The Problem of Pain. The awareness of a moral law. The incarnation of Jesus Christ, which is the fullest expression and greatest fulfillment of this third step. In his final analysis of the Incarnation, he includes a defense of how we can know the difference between true things which fulfill real longings and human invention which helps us cope with anxiety. His answer can be summed up in one word, a word he uses towards the end of the paragraph: Anfractuosity. This article previously appeared on the Bird and Babe. I tend to agree with Lewis, but opponents are looking for something to find fault with. As I see it, the underpinnings of their faith (anti) is flawed, so any other consideration is thereby flawed as well.